Here is the official speech of C.E.O Facebook and one of the world richest men, Mark Zuckerberg at Harvard University on Friday, 26th May, 2017. 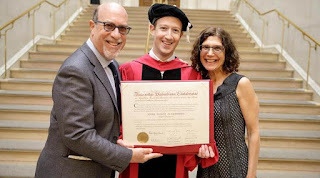 Read his Commencement speech at Harvard Gardens below. 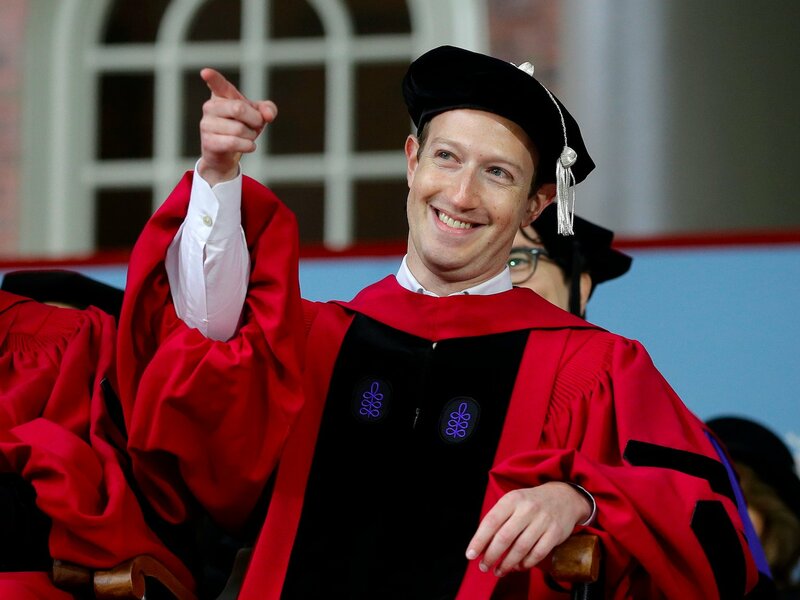 Mark Zukerberg's Commencement Speech at Harvard 2017. President Faust, Board of Overseers, faculty, alumni, friends, proud parents, members of the ad board, and graduates of the greatest university in the world, I'm honored to be with you today because, let's face it, you accomplished something I never could. If I get through this speech, it'll be the first time I actually finish something at Harvard. Class of 2017, congratulations! But my best memory from Harvard was meeting Priscilla. I had just launched this prank website Facemash, and the ad board wanted to "see me". Everyone thought I was going to get kicked out. My parents came to help me pack. My friends threw me a going away party. As luck would have it, Priscilla was at that party with her friend. We met in line for the bathroom in the Pfoho Belltower, and in what must be one of the all time romantic lines, I said: "I'm going to get kicked out in three days, so we need to go on a date quickly." Actually, any of you graduating can use that line. I didn't end up getting kicked out -- I did that to myself. Priscilla and I started dating. And, you know, that movie made it seem like Facemash was so important to creating Facebook. It wasn't. But without Facemash I wouldn't have met Priscilla, and she's the most important person in my life, so you could say it was the most important thing I built in my time here. You're graduating at a time when this is especially important. When our parents graduated, purpose reliably came from your job, your church, your community. But today, technology and automation are eliminating many jobs. Membership in communities is declining. Many people feel disconnected and depressed, and are trying to fill a void. As I've traveled around, I've sat with children in juvenile detention and opioid addicts, who told me their lives could have turned out differently if they just had something to do, an after school program or somewhere to go. I've met factory workers who know their old jobs aren't coming back and are trying to find their place. To keep our society moving forward, we have a generational challenge: to not only create new jobs, but create a renewed sense of purpose. I remember the night I launched Facebook from my little dorm in Kirkland House. I went to Noch's with my friend KX. I remember telling him I was excited to connect the Harvard community, but one day someone would connect the whole world. The thing is, it never even occurred to me that someone might be us. We were just college kids. We didn't know anything about that. There were all these big technology companies with resources. I just assumed one of them would do it. But this idea was so clear to us -- that all people want to connect. So we just kept moving forward, day by day. I know a lot of you will have your own stories just like this. A change in the world that seems so clear you're sure someone else will do it. But they won't. You will. But it's not enough to have purpose yourself. You have to create a sense of purpose for others. I found that out the hard way. You see, my hope was never to build a company, but to make an impact. And as all these people started joining us, I just assumed that's what they cared about too, so I never explained what I hoped we'd build. Nearly everyone else wanted to sell. Without a sense of higher purpose, this was the startup dream come true. It tore our company apart. After one tense argument, an advisor told me if I didn't agree to sell, I would regret the decision for the rest of my life. Relationships were so frayed that within a year or so every single person on the management team was gone. That was my hardest time leading Facebook. I believed in what we were doing, but I felt alone. And worse, it was my fault. I wondered if I was just wrong, an imposter, a 22 year-old kid who had no idea how the world worked. Now, years later, I understand that *is* how things work with no sense of higher purpose. It's up to us to create it so we can all keep moving forward together. Every generation has its defining works. More than 300,000 people worked to put a man on the moon – including that janitor. Millions of volunteers immunized children around the world against polio. Millions of more people built the Hoover dam and other great projects. These projects didn't just provide purpose for the people doing those jobs, they gave our whole country a sense of pride that we could do great things. Now it's our turn to do great things. I know, you're probably thinking: I don't know how to build a dam, or get a million people involved in anything. But let me tell you a secret: no one does when they begin. Ideas don't come out fully formed. They only become clear as you work on them. You just have to get started. If I had to understand everything about connecting people before I began, I never would have started Facebook. Movies and pop culture get this all wrong. The idea of a single eureka moment is a dangerous lie. It makes us feel inadequate since we haven't had ours. It prevents people with seeds of good ideas from getting started. Oh, you know what else movies get wrong about innovation? No one writes math formulas on glass. That's not a thing. It's good to be idealistic. But be prepared to be misunderstood. Anyone working on a big vision will get called crazy, even if you end up right. Anyone working on a complex problem will get blamed for not fully understanding the challenge, even though it's impossible to know everything upfront. Anyone taking initiative will get criticized for moving too fast, because there's always someone who wants to slow you down. In our society, we often don't do big things because we're so afraid of making mistakes that we ignore all the things wrong today if we do nothing. The reality is, anything we do will have issues in the future. But that can't keep us from starting. So what are we waiting for? It's time for our generation-defining public works. How about stopping climate change before we destroy the planet and getting millions of people involved manufacturing and installing solar panels? How about curing all diseases and asking volunteers to track their health data and share their genomes? Today we spend 50x more treating people who are sick than we spend finding cures so people don’t get sick in the first place. That makes no sense. We can fix this. How about modernizing democracy so everyone can vote online, and personalizing education so everyone can learn? Many of our parents had stable jobs throughout their careers. Now we're all entrepreneurial, whether we're starting projects or finding or role. And that's great. Our culture of entrepreneurship is how we create so much progress. An entrepreneurial culture thrives when it's easy to try lots of new ideas. Facebook wasn't the first thing I built. I also built games, chat systems, study tools and music players. I'm not alone. JK Rowling got rejected 12 times before publishing Harry Potter. Even Beyonce had to make hundreds of songs to get Halo. The greatest successes come from having the freedom to fail. Let's face it. There is something wrong with our system when I can leave here and make billions of dollars in 10 years while millions of students can't afford to pay off their loans, let alone start a business. Look, I know a lot of entrepreneurs, and I don't know a single person who gave up on starting a business because they might not make enough money. But I know lots of people who haven't pursued dreams because they didn't have a cushion to fall back on if they failed. We all know we don't succeed just by having a good idea or working hard. We succeed by being lucky too. If I had to support my family growing up instead of having time to code, if I didn't know I'd be fine if Facebook didn't work out, I wouldn't be standing here today. If we're honest, we all know how much luck we've had. Every generation expands its definition of equality. Previous generations fought for the vote and civil rights. They had the New Deal and Great Society. Now it's our time to define a new social contract for our generation. We should have a society that measures progress not just by economic metrics like GDP, but by how many of us have a role we find meaningful. We should explore ideas like universal basic income to give everyone a cushion to try new things. We’re going to change jobs many times, so we need affordable childcare to get to work and healthcare that isn’t tied to one company. We're all going to make mistakes, so we need a society that focuses less on locking us up or stigmatizing us. And as technology keeps changing, we need a society that focuses more on continuous education throughout our lives. And yes, giving everyone the freedom to pursue purpose isn't free. People like me should pay for it. Many of you will do well and you should too. That's why Priscilla and I started the Chan Zuckerberg Initiative and committed our wealth to promoting equal opportunity. These are the values of our generation. It was never a question of if we were going to do this. The only question was when. Millennials are already one of the most charitable generations in history. In one year, three of four US millennials made a donation and seven out of ten raised money for charity. But it's not just about money. You can also give time. I promise you, if you take an hour or two a week -- that's all it takes to give someone a hand, to help them reach their potential. Maybe you think that's too much time. I used to. When Priscilla graduated from Harvard she became a teacher, and before she'd do education work with me, she told me I needed to teach a class. I complained: "Well, I'm kind of busy. I'm running this company." But she insisted, so I taught a middle school program on entrepreneurship at the local Boys and Girls Club. I taught them lessons on product development and marketing, and they taught me what it's like feeling targeted for your race and having a family member in prison. I shared stories from my time in school, and they shared their hope of one day going to college too. For five years now, I’ve been having dinner with those kids every month. One of them even threw me and Priscilla our first baby shower. And next year they’re going to college. Every one of them. First in their families. The third way we can create a sense of purpose for everyone is by building community. And when our generation says "everyone", we mean everyone in the world. Every generation expands the circle of people we consider "one of us". For us, it now encompasses the entire world. We understand the great arc of human history bends towards people coming together in ever greater numbers -- from tribes to cities to nations -- to achieve things we couldn't on our own. We get that our greatest opportunities are now global -- we can be the generation that ends poverty, that ends disease. We get that our greatest challenges need global responses too -- no country can fight climate change alone or prevent pandemics. Progress now requires coming together not just as cities or nations, but also as a global community. But we live in an unstable time. There are people left behind by globalization across the world. It's hard to care about people in other places if we don’t feel good about our lives here at home. There’s pressure to turn inwards. This is the struggle of our time. The forces of freedom, openness and global community against the forces of authoritarianism, isolationism and nationalism. Forces for the flow of knowledge, trade and immigration against those who would slow them down. This is not a battle of nations, it's a battle of ideas. There are people in every country for global connection and good people against it. This isn't going to be decided at the UN either. It's going to happen at the local level, when enough of us feel a sense of purpose and stability in our own lives that we can open up and start caring about everyone. The best way to do that is to start building local communities right now. We all get meaning from our communities. Whether our communities are houses or sports teams, churches or a cappella groups, they give us that sense we are part of something bigger, that we are not alone; they give us the strength to expand our horizons. That's why it's so striking that for decades, membership in all kinds of groups has declined as much as one-quarter. That's a lot of people who now need to find purpose somewhere else. But I know we can rebuild our communities and start new ones because many of you already are. I met Kayla Oakley and Niha Jain, graduating today, too. Stand up! Kayla and Niha started a non-profit that connects people suffering from chronic illnesses with people in their communities willing to help. I met David Razu Aznar, graduating from the Kennedy School today. David, stand up! He’s a former city councilor who successfully led the battle to make Mexico City the first Latin American city to pass marriage equality -- even before San Francisco. Remember when I told you about that class I taught at the Boys and Girls Club? One day after class I was talking to them about college, and one of my top students raised his hand and said he wasn't sure he could go because he's undocumented. He didn't know if they'd let him in. Last year I took him out to breakfast for his birthday. I wanted to get him a present, so I asked him and he started talking about students he saw struggling and said "You know, I'd really just like a book on social justice." I was blown away. Here's a young guy who has every reason to be cynical. He didn't know if the country he calls home -- the only one he's known -- would deny him his dream of going to college. But he wasn't feeling sorry for himself. He wasn't even thinking of himself. He has a greater sense of purpose, and he's going to bring people along with him. It says something about our current situation that I can't even say his name because I don't want to put him at risk. But if a high school senior who doesn't know what the future holds can do his part to move the world forward, then we owe it to the world to do our part too! Congratulations, Class of '17! Good luck out there! P.s: Mark is Now a graduate of Harvard University. Finally!